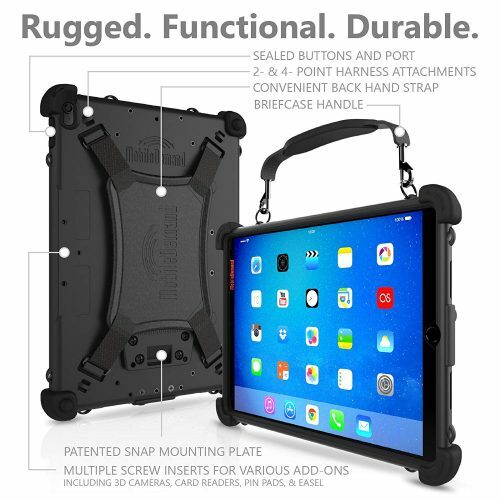 This rugged case for iPad 9.7 inch is proven rugged, easy to carry and offers extended functionality for business and education users. The add-on capability of the case allows for users in retail environments to add PCI-compliant point-of-sale payment terminals and PIN pads to take payments in a mobile setting. In many settings the the built in Snap Mount allows for easy and inexpensive installation in a variety factory office Fork Lift and vehicle scenarios. The xCase for iPad increases drop resistance very substantially. It not only passes the stringent MIL-STD 810G, 516.6 IV military test, it far surpasses its requirements. As is, the test requires 26 drops from 4 feet onto plywood over concrete, one each on each of the six surfaces, one each on the twelve edges, and each on the eight corners of a device. A device must still be operational at the end of 26 drops to pass. Drops are with power off, but after each drop power must be turned on to see if the device still works. And the test actually allows using five test devices. If one survives, it’s a pass. That made no sense to MobileDemand, as out there in the field you won’t have four spares, just in case. So they used just one single iPad in a case for their tests. And they left it on, because it’s quite possible that it’s on while it’s dropped. That single iPad passed the 26 drops of the 4-foot military test. But sometimes they get a little nuts over there at MobileDemand. So they dropped it 26 more times from 5 feet. Still worked. 6 feet, 26 more drops. Still worked. 7 feet. Passed. Worked. 8 feet (!!). Passed. Still worked. That is more than impressive.